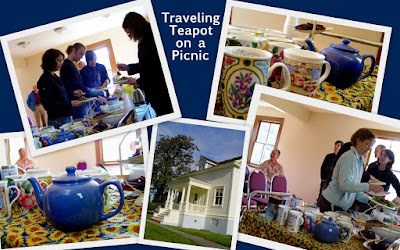 Our family was invited to a picnic along the Columbia Gorge, and the traveling teapot went along. We met our friends at a beautiful park on the shores of the Columbia River and because it was somewhat breezy, had our picnic inside a restored and historic "Lock Tender" house. Cozy, warm, and comfortably appointed, we enjoyed a lunch of stacked taco salad with toppings, clusters of Interlaken grapes, hot tea, and cookies. Because it was a picnic, porcelain tea mugs accompanied the traveling teapot rather than teacups and saucers. Peppermint and chamomile teas were the choice of the day, and the story of the traveling teapot was told. After a leisurely lunch, the traveling teapot was packed back into a wicker hamper and packed away for its next adventure. While our family and friends hiked on a beautiful autumn day, the traveling teapot rested in the hamper, waiting for it's next teatime experience. How fun it must be to be a traveling teapot! Well it's fun reading about that traveling teapots adventures. Looks like a great day! Looks like a fun gathering! That lock-tenders house looks perfect for such an afternoon. Thanks for sharing!